Trainers who have an active VIP Status receive special bonuses and exclusive features to their account for the duration of time that the VIP Status is active. Trainers with an active VIP Status will have a purple background on friend lists and on various rankings while those without an active status will have a dark gray background. Additionally, VIP Trainers will have a badge on their picture, which, depending on their preference, will or will not display the Trainer's VIP Level. When the VIP Status is active, the icon at the top of the screen will display its duration. When inactive, it will be grayed out . Rewards earned after each battle won on the Campaign Map and in the Clockwork Dungeon are increased by 50%. The Trainer can participate in VIP Events. The Trainer can use the Gold Vault once every eight hours. One extra slot for potions is given. One extra slot for summoning a Clan Siege Sprite. Pressing the at the top of the main screen next to the active or inactive VIP Ticket will bring a window where the Trainer can see whether their VIP Status is active or inactive, their current VIP Level in the left of the window and on the badge, the next VIP Level in the right of the current one, as well as the option to navigate between levels, the benefits of each VIP Level listed under them, the option to check or uncheck if to have their VIP Level displayed on leaderboards, the total amount of Gems the Trainer purchased and the total amount of Gems needed to reach the next VIP Level, and the , and buttons. Pressing the first button will take the Trainer to the screen where they can purchase Gems in exchange for real currency. Pressing the second button will take the Trainer to the screen where they can purchase one of three available VIP Tickets and pressing the third button will bring up a screen with some of the basic VIP benefits. Additionally, after each Campaign Map or Clockwork Dungeon battle won, if the Trainer does not have active VIP Status, the button will be shown under the VIP chest and pressing it will access the same interface as above. 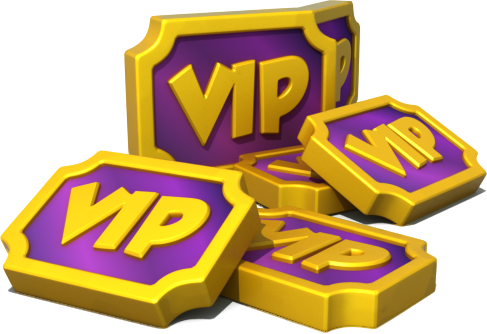 VIP Levels give Trainers with an active VIP membership extra features in addition to the basic ones. 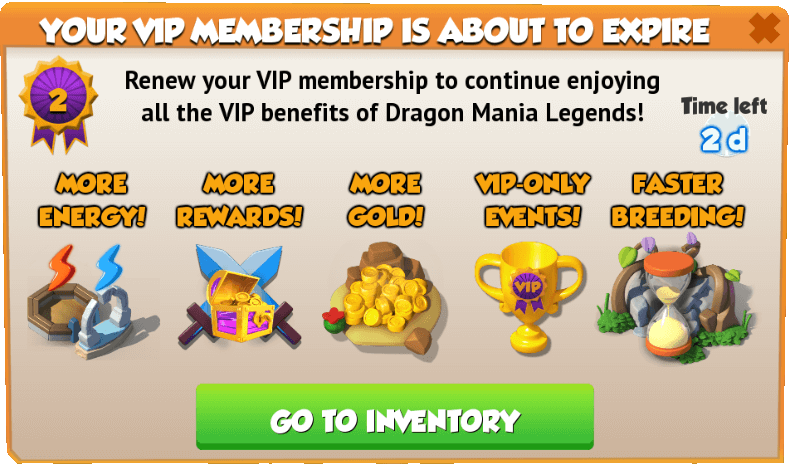 There are 20 different VIP Levels and the only method to get to a higher VIP Level is through purchasing Gems in exchange for real currency. 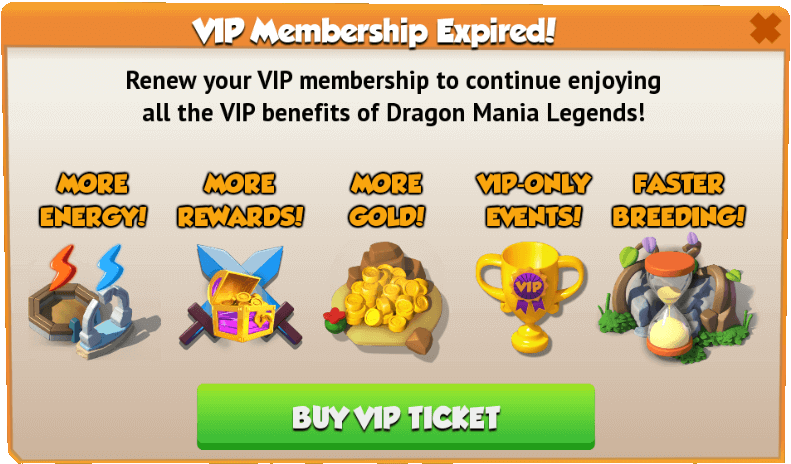 Once a VIP Level is obtained it is permanent, regardless if, at some point, the membership expires and is then later renewed. Trainers have the option of hiding their VIP Level wherever their VIP Status is displayed to other Trainers. 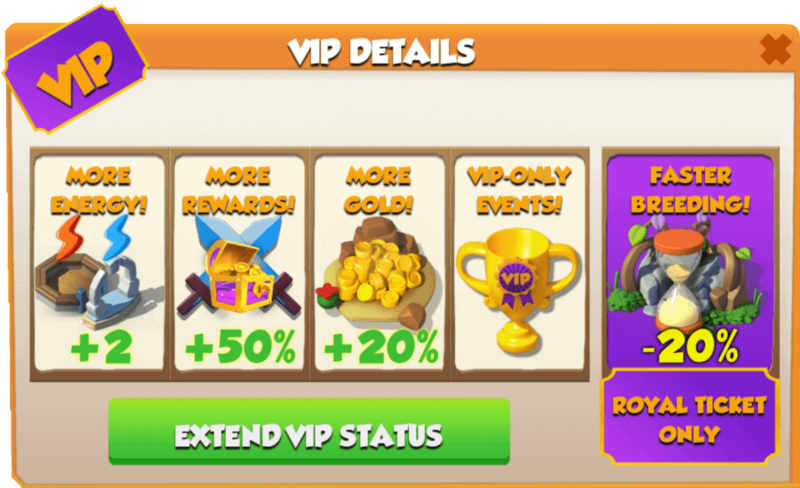 Only purchases of Gems count toward the VIP Level, whether they come from purchasing them directly or from the Clam, bundles or other various in-game promotions. 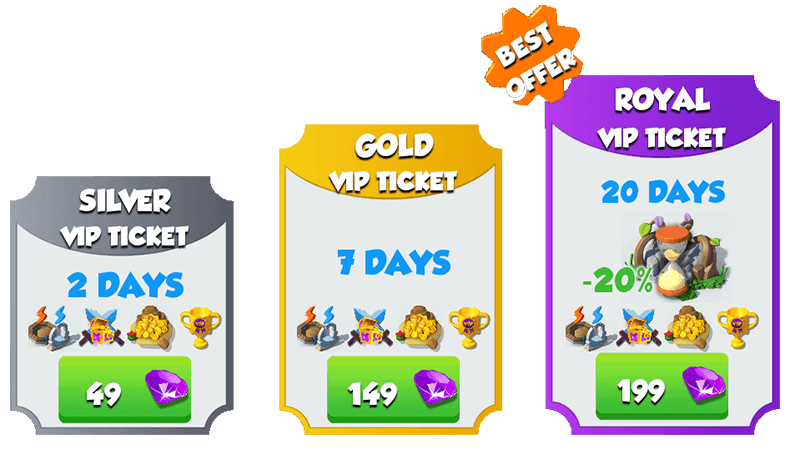 ↑ One ticket is awarded per new VIP Level, once the level is reached, beginning with Level 4. ↑ Each level requires a minimum amount of Gems to be purchased in order to reach that level from the previous one. For example, a VIP Level 3 Trainer needs to purchase 55 Gems in order to reach VIP Level 4 while a VIP Level 9 Trainer needs to purchase 1,250 Gems in order to reach VIP Level 10. ↑ This represents the total amount of Gems needed to be purchased in order to reach a particular level from VIP Level 1. For example, a total of 2,250 Gems are needed to be purchased by a VIP Level 1 Trainer in order for them to reach VIP Level 9. ↑ Does not apply to days with a Dragon as the prize. ↑ Option can be used even without an active VIP Status, as long as the Trainer's VIP Level is at least 11. The above three tickets are automatically activated upon purchase and for the number of days specified. Tickets obtained from other methods can be activated individually by going to the inventory and pressing the option and one ticket will last for a period of 24 hours. Seven tickets are given to Trainers who have made their first in-app purchase with real currency, regardless of the price and item bought. Tickets can also be obtained from the Totem of Friendship, where one is given for reaching 2,400 Friendship Points, three are given for reaching 17,000 Friendship Points, and seven are given for reaching 80,000 Friendship Points and from the Dragon Collector Leaderboard, where seven tickets are given for accumulating 8,000 points. Additionally, one ticket is given upon reaching Level 10 (which must be activated on the spot) and one ticket can be given at random after reaching the maximum level, every time a Trainer earns the same experience that was needed to reach that last level from the second-last level. They can also be received from Calendar Events and Faction Events, bought from the Whale-Mart or bundles in the Main Shop, found in Divine Chests or can be given as gifts from Gameloft for various occasions, celebrations or game-related milestones. When breeding or hatching a Dragon, the game displays only the first two highest units of time. Update 4.0 made it compulsory for the VIP Ticket received upon reaching Level 10 to be activated on the spot. Update 3.7 introduced the Whale-Mart along with the possibility of obtaining VIP Tickets through this feature. Update 3.2 added 8 new VIP Levels and made significant changes to the unlockables and rewards given for each level. Update 3.0 updated the VIP benefits screen in order to display the Gold Vault being made available to all Trainers within the same update. 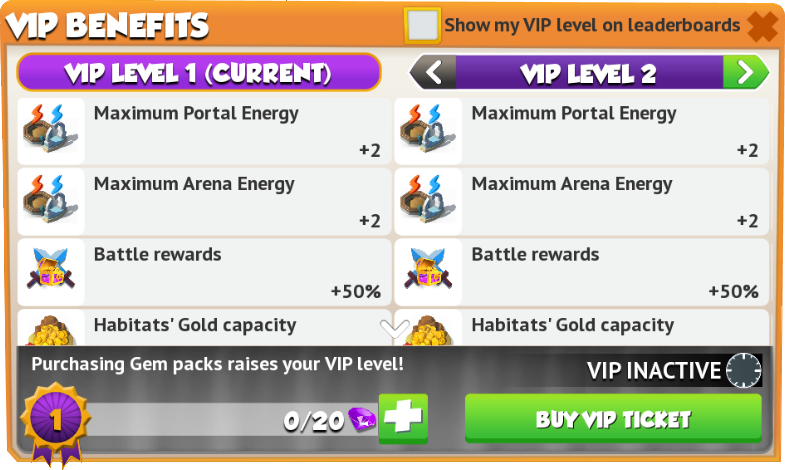 Update 2.9 updated the VIP benefits screen in order to show the benefits introduced in Update 2.7. Additionally, the purchasable VIP Tickets now each have their own background. Update 2.7 gave VIP members of all levels extra slots for potions and keys in the Enchantment League. Update 1.9 gave the Trainers the ability to hide their VIP Level from other Trainers. Update 1.8 introduced the VIP Levels. All Trainers that had their accounts created before these levels were introduced received, at least, VIP Level 2. From this update onward, newly-created accounts start at Level 1. The VIP Tickets were divided between three classes, namely Silver (2 days), Gold (7 days) and Royal (20 days). Trainers who had a lower VIP tier and bought a better ticket had their entire VIP period converted to the higher tier. 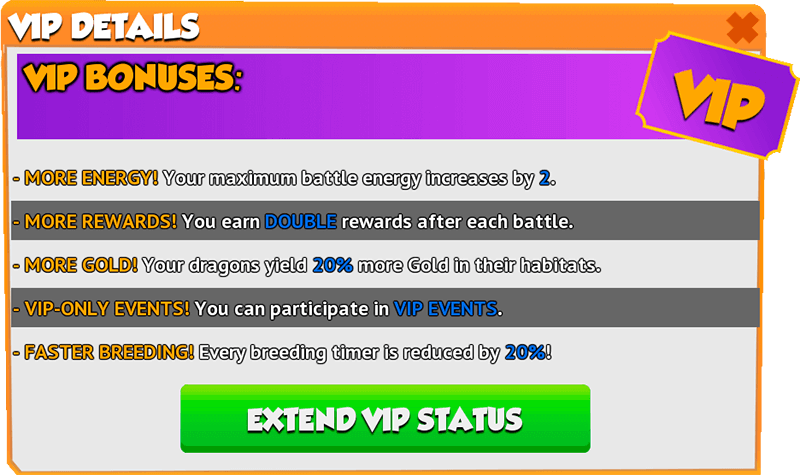 The 20% breeding & hatching time reduction was exclusive to Royal VIP members. The background color for Trainers with an active VIP Status is now purple on leaderboards. Update 1.1 added a feature that visibly shows whether Trainers have VIP active or inactive. Starting with this update, Trainers reaching Level 10 receive one VIP Ticket. Trainers who were already Level 10 or higher at the time of the update automatically received the ticket. Additionally, the rewards earned after winning battles were doubled before this update and were lowered to 50% starting with this update. At some point in the game, in the first version (Version 1.0), the price for the first VIP Ticket was 29 Gems, the price for the second ticket was 49 Gems and the price for the third ticket was 99 Gems.